You have a variety of options when choosing a floor. Hardwood, laminate, carpet, and tile are the most popular, but how do you choose between them? Let’s take a look at a few of the qualities of each. Hardwood floors are made of 100% wood and hardwood has a beautiful and timeless look. 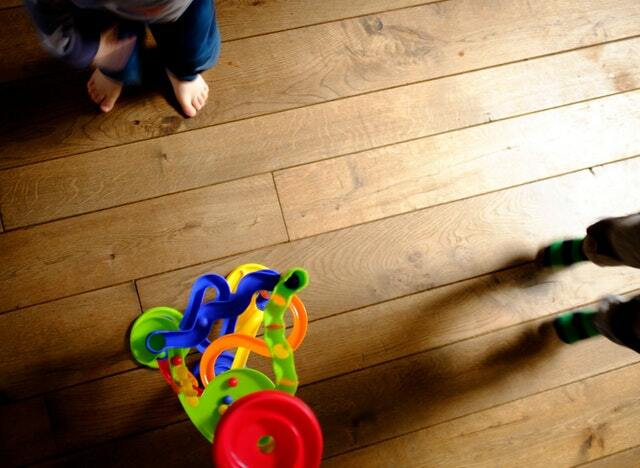 It is long-lasting and durable, and when well-maintained, hardwood has a better resale value than laminate. Hardwood is very impact resistant, though it is always more expensive than laminate wood floors and takes longer to install. Depending on the type of wood chosen, it can be also very eco-friendly. Laminate floors are made of fiberboard covered by a visible designed layer, to mimic the look of wood or stone, and a transparent layer for wear. Like hardwood, it is has a classic look. It is softer than hardwood and it is better for homes with pets, because the wear layer is more scratch resistant than hardwood. Laminate floor is less expensive than hardwood and cheaper to install. Laminate lasts about 10 years. Carpeting comes in a variety of styles: from short pile to plush. It is easier and less expensive to install, as well as less expensive to maintain and repair. However, cleaning beyond basic vacuuming usually requires a professional. Carpeting is simple and gives you a variety of options, and adds a warm coziness to the interior design. However, some consumers may consider carpeting to be a dated look. Tile floors come in a variety of options, including ceramic, terra cotta, stone, granite, and marble. Tile floors are very durable and are great for high trafficked kitchen and bathroom areas. Tile is simple to clean and might be the best option for pet-owners—easier to clean than carpeting, less slippery for pets than laminate, and easier to maintain than hardwood. It can also give your home a more unique style. Another advantage of tile is that it can be very eco-friendly. No matter what flooring type you choose, Flooring Headquarters is your local resource for all your flooring needs. Whether in Altamonte Springs, Winter Springs, Casselberry, Longwood, or anywhere in Central Florida, we help you get the floor you need.